After much anticipation, Stormy will be joining us in the flying arenas of Minion Masters! We’re also introducing a number of Balance Changes to this patch as well as some general bug fixes. 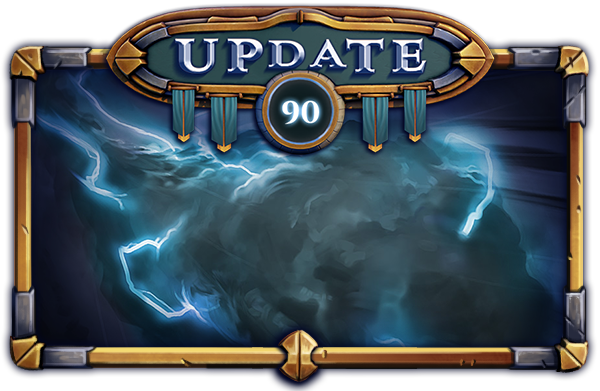 Stormbringer’s trusty sidekick from Forced Showdown arrives to Minion Masters! This clumsy cloud shoots Chain Lightning as its attack, dealing damage to itself in the process. It comes with the new Zen-Chi Flow affinity, where if your last played card was from the Zen-Chi faction, he gets double the health! Stormy is available to be crafted for 2000 shards or can be earned from Power Token spins. Walking Blind Date is a card that has been very weak for a long time, but also a challenge for us to buff. Rescaling it risks the cycle potential of the card being too powerful, so we decided an interesting direction to take the card would be to give it additional utility by being able to redirect and “kite” enemies through the Taunt ability. While the Sniper Scrats were decently powerful for a short period of time, they fell off soon after, and we feel a moderate buff like this can give them the boost they need to compete. Howling Moon is a card that has been fairly problematic to play against on multiple skill levels due to its explosive combo potential. Often decks that used the card felt uninteractive or somewhat unfair when you would die to two Raged and Frenzied Werewolves dealing thousands of damage to you in the manner of a few seconds, even after previous nerfs to the Werewolf unit. We explored several different iterations on how we could change this card yet its ability to be comboed so effectively only served to make it more powerful in the end, so we settled for a solution that still kept the spirit of the card. Combustion is a card that was often featured exclusively in “cheese decks”, which revolved around detonating a large number of small minions at the Master tower to do extreme amounts of damage in a short period of time if it wasn’t reacted against. The volatile nature of this playstyle often felt unfun to play against. At the same time, we felt outside of those situations it was hard to effectively use Combustion, but its usage as a face damage spell was a limiting factor in any adjustments we wanted to make. We hope that this change can solve both of those conditions. Propeller Horde is a card that has felt somewhat overtuned since its buff after the release of the card. We feel its original values of having 5 and 10 Propeller Scrats still leaves the card in a useful state, while being less overwhelming to play against in decks that buff all of the units. To tie in with the release of Stormy, we’re choosing to further reinforce Chain Lightning’s ability to stun the battlefield rather than make it directly compete as a damage dealing card with other options such as Fireball. Shieldguard of Light was a popular card from the new Battle for Light’s Reach Battle Pass, and we ultimately feel it was a bit overtuned in terms of what it was capable of. With its capable DPS and large Health pool combined, it was more of a “One Man Army” than the Tank role we initially planned for it. We’re opting to reinforce the latter with a small damage tweak to the card without risking making the card feel too weak. Guardian’s ability to protect against self-inflicted damage was an ability that restricted design space on cards like Stormy, as well as future cards that we may intend to damage themselves as a drawback to a particularly powerful effect. Adjusted the look of Conquest Cards in the Deckbuilding menu to prevent confusion about ownership of the cards. Adjusted the Lobby icons to avoid confusion regarding the Premade 2v2 queue. Tweaked the visual effects of Shields so that it fades out towards the ground. Updated VFX for Boomer, Fireball and Armor of Light explosions. Updated VFX for Colossus’ attack swing. Collection View will now remember that you had it open when you re-enter Deckbuilding. A guild that has pending applications but reaches its maximum member count will now delete all pending applications - Thanks Zundmaster! Made Teleport interactions with roots consistent. All teleport effects (Succubus, Incubus, Netherstep and Trick Swap) break immobilizing effects such as roots or bear traps - Thanks Khazlariko! Fixed Currency totals disappearing from the bottom right of the menu if you bought an item - Thanks DerpSmashed! Fixed golden donator name not being given out to Streamer puffs if they donated on the Watch & Win screen - Thanks Zundmaster! Fixed Hypnotised Xiao Long keeping the spell indicator above your cards after it is dead - Thanks Ty! Fixed the KPI3 skin missing its link in the description - Thanks Kishin! Fixed Cursebearer being able to curse units while in Black Hole - Thanks Memfisto! Fixed Morgrul the Swarmer King not roaring or summoning swarmers on death if it was being healed - Thanks videogamer77 and Julaiwnl! Fixed an instance where scores on the Guild Leaderboard could be missing a “K” on the end - Thanks Kishin! Fixed the Twitch chat link from betadwarfbot being broken - Thanks RynoRanger ACTUAL! Fixed Master skins not using the correct dialogue when previewing them at the power tower - Thanks GReY WolF! Fixed Master dialogue playing when opening any rewards at the power tower. Fixed Stormbringer gaining perk 2 removing marksmanship from enemy units. Fixed Arcane Golem’s new vfx not being Worldspace. Fixed the Versus screen being too bright in the Day Snow skybox. Fixed the updated Empyrean models not being highlighted by spell effects. Fixed the Werewolf unit not being highlighted by spell effects. Fixed Plasma Marines’ guns not being highlighted by spell effects. Fixed the search term for Conquest Cards incorrectly being Guild Cards. Fixed Fireball and Healing Fireball nested tooltips saying Scrat Horde in the Gambler’s Ball description. Fixed Werewolves receiving Mana Surge. Fixed the bloom on Power Towers when you are low HP being too high. Fixed Spectator Puff Emotes being too dark. Fixed Guardian shield being hard to see on Day Snow skybox. Fixed being able to place Diona traps on top of Mordar tombstones. Fixed switching avatars off of an animated avatar causing all avatars to be dark until you restarted the game. The balance this time really terrified me. The nerf on Propeller Horde seems very very unnecessary and makes no sense. As you say"in a useful state",so why not nerfing Howling Moon in a "useful" state but instead keeps its powerful spirit of the card? Just because it's a legendary card but Propeller Horde's not? So when do you nerf every common card to be in a "useful" state? Divine Warrior's shild duration from 5 to 4s as she is still in a "useful" state? Scrat Horde's mana cost from 3 to 5 llike original state as they could still be in a "useful" state? What about nerfing screaming scrats back to 2 mana since it's still in a useful state? The nerf on Propeller Horde not only is a huge hit to rage build as the dps and the count nerf change the interaction to big size unit but decrease the variation of the meta build since one of the strong horde card have fallen which cause small spell are getting more less attractive for players to choose. I am a new player and now my rank is diamond and also I buy a premium upgrade . I really love this game and the insight of some card design,and now I kinda doubt your insight in balance change. So what? Why buffing Inflitration's marines count from 3 to 4 while it was still in a useful state then? or just because it's a epic card? I am really disappointed this time. I used to think I find a good game with good team to develop it,and now I am not sure any more. If 92 update keep this ridiculous "useful state" excuse to balance any common or rare card in a unnecessary way,I would quit this game. People were ranting about propeler horde for a long time, I assume you were playing a lot yourself since you basically said "you nerfed this rare card, I quit". Go ahead. I´m not sure if a Dev ever should listen to someone who "just started" playing the game regarding balancing of stuff. Propeler horde is a really strong card especially in KP decks. if a shielded hord gets in your face and you have no AoE clear available its basically GG. I think the change is justified and makes the card still viable. Not sure if it shouldn´t be nerfed even further but lets see. Howling moon will probably no longer be played in its current state. You don´t see it being played beside the combo with the 2 rage wolfs, so with this change I would probably also reduced mana costs a bit. Also where do the wolfs spawn? "The nerf on Propeller Horde seems very very unnecessary and makes no sense. As you say"in a useful state",so why not nerfing Howling Moon in a "useful" state but instead keeps its powerful spirit of the card? Just because it's a legendary card but Propeller Horde's not?" Finally! this was the balance update most of us were looking forward too. Very well done! Nothing about the constant disconnects and lags. The game is literally unplayable for many of us and the devs are not even adderssing the issue. wtf? This change is obviously very good. I have modified many overly strong decks. Maybe you don't agree, but this is why your class is in diamonds, and I only play two months and all three are superheroes. PS‧ I am a free player.